John Pilbeam has been growing these plants for some sixty years, and has wandered throughout Mexico and the USA southern states seeking them out to photograph them in variety, and enjoy their exuberant flowers. After some nudging from the accepted expert on the genus, Nigel Taylor, he has produced a book for the benefit of enthusiasts of this stunning genus of cacti, as well as hopefully to inspire more interest in these rewarding plants among other cactus growers who have perhaps not realised the full potential of them. 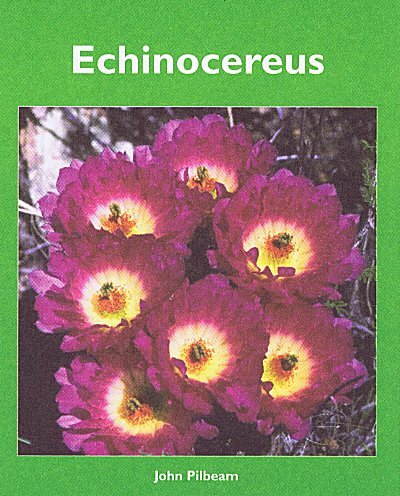 In these pages there should be enough inspiration to achieve this end, and with the co-operation of other Echinocereus enthusiasts he has covered all recognised species and subspecies, as well as some that are on the fence, with approaching 200 photographs in habitat or in cultivation.The front cover reproduced here gives an idea of the wonderful flowers that this genus produces.